TORONTO -- It's hard to blame Dougie Hamilton if the 19-year-old defenseman doesn't quite know whether he's coming or going. One of the top prospects at his position in the sport, Hamilton was given a small taste of life in the NHL recently when he was among 29 players invited to take part in the National Hockey League Players' Association 2012 Rookie Showcase. Hamilton, decked out in Boston Bruins' black and gold, was waiting to be photographed for his first NHL hockey card as he spoke confidently of his desire to play in Boston this season. In nearly the same breath, though, he said he also is prepared to return to the Niagara IceDogs of the Ontario Hockey League for the 2012-13 season. 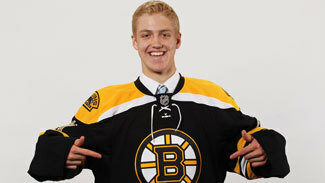 Regardless of when their NHL careers begin, Dougie Hamilton and Jared Knight forever will be linked with Tyler Seguin as the three players the Boston Bruins selected in the 2010 and 2011 drafts with the picks they acquired from the Toronto Maple Leafs in exchange for Phil Kessel. Hamilton grew up in Toronto and his family had Maple Leafs season tickets, but he said the thought that he could have been a Leaf barely crosses his mind. "I don't really think about it anymore," Hamilton told reporters recently at the NHLPA Rookie Showcase. "I thought about it right after I got drafted a little bit with some of my Toronto friends texting me and stuff, but I'm pretty happy with where I am and I don't really think I'd like to be in Toronto. "I think that Kessel is doing pretty good and so far it's only Seguin in the NHL right now, so Knight and I have some [work] to do and hopefully we can make it a little more of favorable trade for Boston." Such is life for the ninth pick of the 2011 NHL Draft, who finds himself in a state of hockey limbo. By all accounts the 6-foot-5, 193-pound blueliner is ready to compete for a spot on the Bruins' opening-night roster, but because of the uncertain labor future in NHL and his age, the 19-year-old is eligible to play either in the NHL or back in the OHL; players drafted out of the Canadian Hockey League must be 20 before they can play in the American Hockey League. "To play in the NHL would be a dream come true," Hamilton told NHL.com, "but if there is a lockout then I'll be back in junior and I'll just continue to work towards my goal. I mean, it doesn't really matter where I start the year [because] the goal doesn't change -- it's to play in the NHL and that's what I'm looking forward to." Hamilton was named the CHL Defenseman of the Year last season after he led all OHL defensemen with 72 points in 50 regular-season games to help Niagara finish atop the OHL Eastern Conference standings. However, he said it took a few weeks to get over losing in the OHL Finals to fellow Bruins prospect Jared Knight and the London Knights. "He's a lot easier to play with than to play against," Knight, Boston's 2010 second-round pick, said of Hamilton. "He's got the big shot, plays big minutes ... long reach, tough to get around. He can get pretty annoying." While the loss to London stung, Hamilton had far too busy of a summer to let it linger. Weeks after his OHL season ended, Hamilton was training and preparing for Bruins development camp in July, and that was followed by the Russia-Canada Challenge in August. "It was really high-level hockey, especially for the middle of summer," Hamilton said of the four-game series between the top junior players from Russia and Canada. "The Russians were very good and it was a maybe little bit tough with all the travel, but to be able to do that in the middle of summer kind of makes you a little bit more comfortable and hopefully better prepared going into an NHL camp." Hamilton quarterbacked Canada's No. 1 power-play unit and had the game-winning goal in Game 1 of the series in Yaroslavl, Russia. "His play speaks for itself," said Toronto Maple Leafs prospect Morgan Rielly, Hamilton's defense partner at the Russia-Canada Challenge. "He's a great skater, he's big, has a great shot and was just a great partner. I don't think there was ever a time where I felt like I couldn't count on him to get out of a situation or create something up ice. Even at 5-on-5, a lot of poise, smart with the puck, a very smooth skater and I'm sure he'll have a huge career in Boston." Hamilton said he has modeled his game after and drawn comparisons to "big, mobile defensemen who play at both ends [of the ice] like Jay Bouwmeester, Brent Burns and Rob Blake," but added that he still has plenty to learn regardless of when his NHL career starts. "It's a whole other jump [to the NHL]," Hamilton said. "The jump from minor hockey to the OHL was big when you start playing with bigger and stronger guys, and jumping to the NHL would just be another level altogether. So I have to learn what it's like to play my game [in the NHL] and I'll have to adapt to it and get confident and comfortable out there."